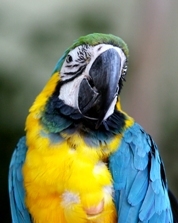 There are mornings when I feel like a parrot that sits in the corner repeating the same things over and over with nothing to show for my words. This is one of those mornings. I have already said, “Good morning, it is time to get up” more times than I want to think about. The only one listening is the sun – which is slowly dragging himself up into the sky. My favorite days come when my children spring from the bed without prompting and eagerly tackle chores for the day. It just seems that those days are farther apart than I would like or maybe it is just that I enjoy those days so much that it FEELS like they are far apart. The difference between the days I parrot and the days I parent comes down to my own attitude. Even on those days when the kids jump up and get going, it is not all of them. Even on those days when I have to repeat the requests, it only hinders my progress if I am not doing what I should have been doing any way. 1. Do what you need to do. The more I stay on task then the easier it is for me to get everyone else moving along. 2. Communicate what is needed and necessary. There is a chore chart on the refrigerator as well as a menu for the week. Everyone can see exactly what needs to be done and what is expected for them. 3. Change it up. Lower your voice when speaking or just go in the room and stand there for a few minutes. Changing the way I address a situation is the quickest way to get the attention of a bunch of boys! The sun came up and dragged the rest of the folks out of bed. The day continued despite the fact that I had to ask them to move along more than once. My attitude is still as bright as the sun and even having to repeat “finish your school work” yet again is not going to dampen my day. The difference between parroting and parenting is really the state of mind that I have that moment. Today I will parent.